Want a tablet PC that is larger and more powerful than an iPad, meet ExoPC. ExoPC has introduced a Windows-based tablet PC which is quite powerful than an iPad with WiFi and, yes with Flash support! 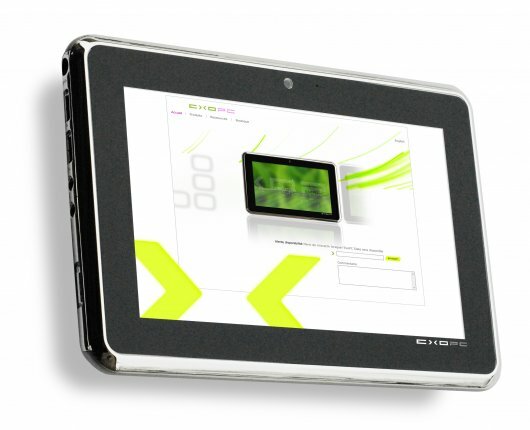 This tablet PC will be available with 32GB and 64GB storage configurations with a 2GB memory and with a webcam. ExoPC has a lot of power packed into this sleak looking tablet. It is powered by an Intel Atom 1.66GHz Pineview-M N450 processor and the 2GB of DDR2 memory is comparable to a desktop or a laptop. It has a large 11.6 inch pressure sentive, multi-touch display with accelerometer and ambient light sensor. Gaming might be an option as this tablet comes with the Intel GMA500 graphics and with HD 1080p display. The onscreen keyboard has the “stroboscopic effect” which helps in reducing typing errors. The tablet computer also has USB 2.0 ports and a HDMI-out with a 1.3 megapixel webcam built in. The ExoPC slate is set for September release and is priced at $599 for the 32GB model. It weights a little more than the iPad at just over 2 pounds and has a battery life of just five hours. Though pricey than the iPad it does come packed with lots of power and features, but for that price I would recommend a standard laptop unless you are a diehard for slates. HP to Introduce HP Slate 2 Windows 7 Tablet! HP Slate price, config leaked! Out of business? WebOS to replace Windows 7 in HP Slate!